The Xiaomi Mi Note went official yesterday with LTE Cat 9 support that grants it up to 450Mbps download speeds. Interestingly, Xiaomi seems to be planning a wider release of the phone than just China as the Mi Note is revealed to support both FDD-LTE and TD-LTE. FDD-LTE is more widely spread than TD-LTE and is used in the majority of LTE markets. 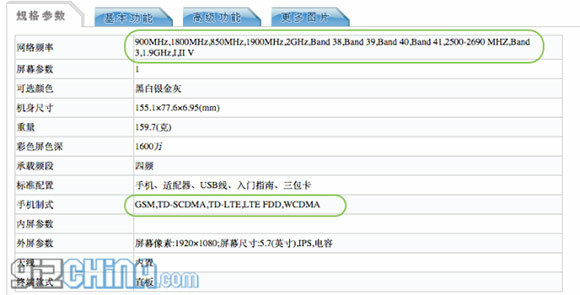 Additionally, the phone supports WCDMA, TD-SCDMA 3G and basic GSM networks. If you're looking to import a unit for yourself, pre-orders open on January 20 and shipping begins on January 27. Pricing of the Mi Note starts at $370 (CNY 2299) for the 16GB model and $450 (CNY 2799) for the 64GB one. The Mi Note runs on the Qualcomm Snapdragon 801 with 2.5GHz quad-core CPU and Adreno 330 GPU, 3GB RAM and 16/64GB internal memory. It also supports dual 4G SIM cards. TD-LTE phone can use in Malaysia?